So here's the real story: My Parents Bought Vista. Shocking, yes. But it's not the end of the world. I'm here to tell you there is Life On Vista. Here are practical tips for how to deal with Parental Vista Use. Set their hard drive free! First thing to do is to identify any OEM crap that the vendor will have bundled on there. I had to delete a bunch of Compaq nonsense and then kill a trial-copy of Norton Anti Virus (NAV). Norton Anti Virus: just say no. If you want to run anti-virus software, you want AVG. But also... maybe you noticed that Vista has a very heavy-handed security model of its own, nothing like the "run anything" hey day of windows in previous eras. So maybe it occurred to you that anti-virus software is not such a necessity on Vista as it was on previous Windows Operating Systems. In a way, using anti-virus software and UAC (User Account Control) at the same time, reminds me of the old saw about the Irishman who wore two condoms: "to be sure, to be sure." So I think you ought to choose: UAC or AVG. But the dumbest choice is NAV plus UAC. While you're at it, check for any unwanted startup programs (run "msconfig") and see what services are set to start automatically. Remember the crazy times back at the turn of the millennium? The default SA password for SQL Server was [blank] -- and every man and his hound ran as admin? Those days are gone, Jack, and it's time to reel your parents in. They ain't admins. They are guests on their own machine and they will treat it with respect, dammit. If they have software that demands they run as admin... you'll stick that b*tch in a VM and tell it to shut the hell up. Capisco? Should they need to elevate to admin to install some software... they will beg for help, explain their crazy predicament, apologise for their tom-foolery, and you will vnc onto their machine (with Fog Creek CoPilot, TeamViewer or some other remote assistance tool) and do the necessary. Set their hard drives free! Indexing is turned on by default... and it's a heavy tax your parents don't need. In some crazy scramble to catch up to google, and to make up for their past failures in hard drive searching, they want to bring your hard drive to its knees permanently, so that the one time you search for something, there will be a plethora of irrelevant results presented imeediately and without pause. Turn off indexing. Really. Your mother don't need it. She doesn't even need indexing on her email. If she does have a big pst file that she wants to search, she will operate differently to you and I. She'll carefully craft her search, and then, while the search is running she'll make a nice hot cup of tea. Time is different for each generation. 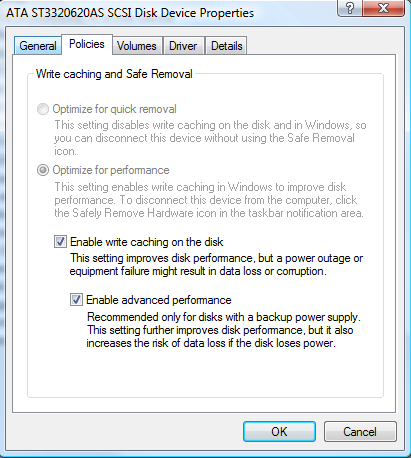 Select "Device Manager", and expand the node for "Disk drives"
Right-click on their primary hard drive, and select "Properties"
Go to the "Policies" tab, and make sure "Enable write caching" on the disk and "Enable advanced performance" are both selected. This can allegedly allow you to lose data if the power goes out suddenly. Yet some people have used it for years without incident. I consider it safe enough. You be the judge. But what have digital cameras got to do with helping parents use Vista? Because the same parents who go out and buy themselves Vista without understanding the repercussions are the exact kind of people who purchase a digital camera on a whim. So generally a child who has one of these problems also has the other. I think. So for this one, I urge you to read Scott Hanselman's excellent article, On Losing Data and a Family Backup Strategy. No Aero Glass for You! There's nothing for you to do in this step, just something to be aware of. Vista Home Basic doesn't support the Vista Aero theme. Maybe you knew that already, but it had slipped by me, and I was baffled why it wasn't available, wasting time to trying to work out what was so bad about their machine that it didn't give Aero as an option. Turned out that their hardware was plenty good enough. But the stingy buggers in the shop had pulled a swift one on the poor dears and given them the criminally downscale poor cousin of vista -- the Suburban Ghetto edition. Apparently it's an easy registry tweak to get around -- but I haven't tried it as yet. The history of why this version exists is a kind of unholy alliance between sellers of substandard hardware and mercenary-cannibals from the camels and rubber duckies sect of capitalism. There's a lawsuit in the US. There is life after a Vista install. You don't need to upgrade to XP.